Immigrating has always had high risk crossing the seas, and for those who survived the travel faced a full documentation and most often medical review. Newly arrived immigrants to North America – specifically Canada and the USA – were documented at processing stations and quarantine locations at their entry ports. So as the Irish arrived in every port in North America to escape wars, mistreatment, and famine, genealogists and family researchers must expand their research past New York. 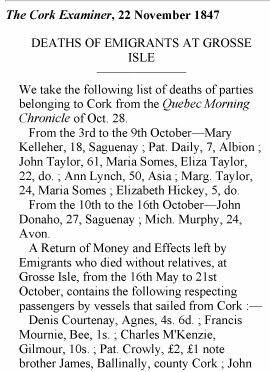 Have you checked for your Irish ancestors in the Gross Île, Port of Québec records? Although the death rate was high, researchers may locate those who survived; and with a keen eye toward analysis, hints and names of other family members may be revealed. 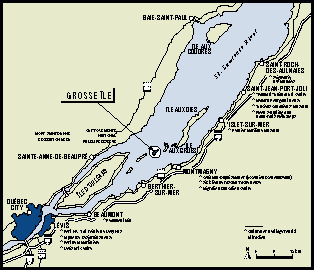 Gross Île “was a quarantine station for the Port of Québec from 1832 – 1937. This quarantine station, located in the middle of the St. Lawrence River just south-east of Quebec, was originally established to contain the cholera epidemic in 1832. Over 8000 immigrants, mostly Irish died of “Ship Fever” from 1847 - 1848, some referred to these ships as “coffin ships,” due to the typhus epidemic. It has been estimated that over five thousand Irish were buried at sea. Many were interred in mass graves. Visit Irish Central, The Ghosts of Grosse Ile. 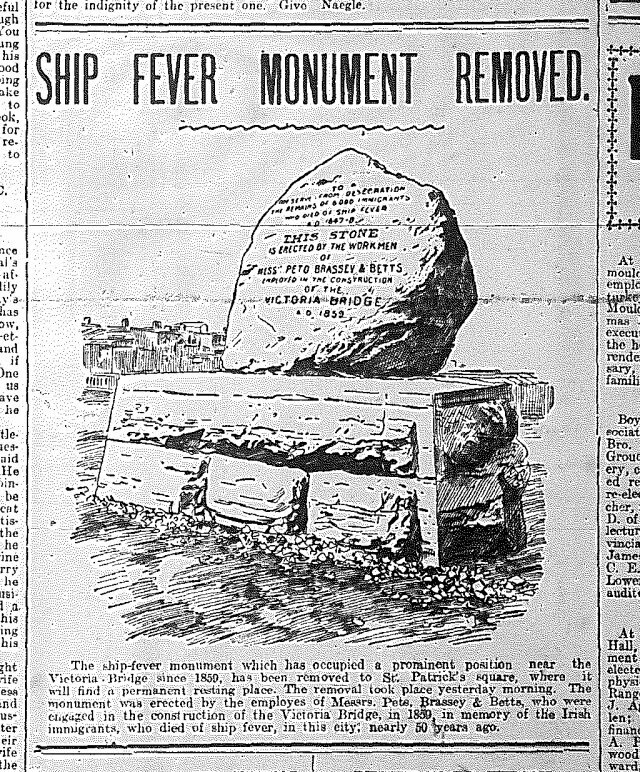 A monument was even erected in 1850 to honor those lost during the transport. 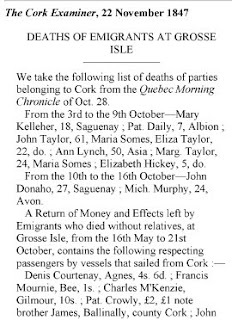 Yet, in the 1847-1848 timeframe over 38 thousand Irish did arrive in Toronto. Toronto also had a high death rate, about 1100 Irish immigrants died of starvation and the harsh Canadian winters. For more information research Toronto’s Ireland Park, a memorial for the Famine Irish. Know that quarantine stations were not uncommon. One had been established as early as 1785 in Partridge Island, New Brunswick, near Saint John. Another quarantine station was at Windmill Point, where over six thousand, mostly Irish, were buried. Passenger Lists, 1865-1922, Library and Archives of Canada. The searchable database provides information on ship, ports and passengers. Immigrants at Grosse Île Quarantine Station,: Library and Archives of Canada. 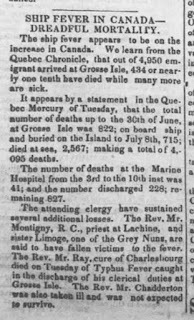 It is here that the researcher may find names indexed of ancestors that died at sea, hospital registers, burials at Grosse Île as well as births, baptisms and marriages that occurred at the Quarantine Station. There is also a comprehensive list of “names recorded on the memorial with ages and ship noted. Newspapers often named passengers and deaths. 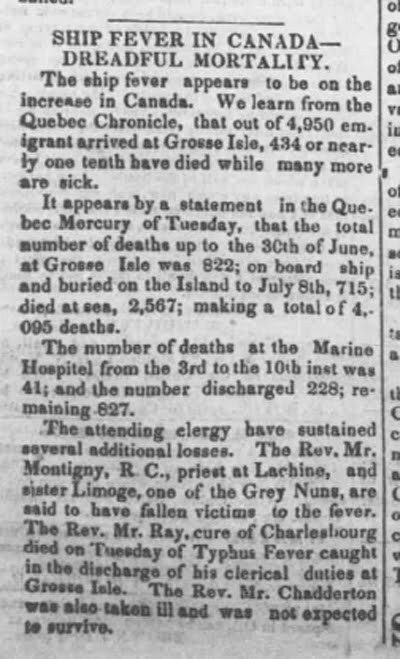 1847, Grosse Ile: A Record of Daily Events, Andre Charbonneau and Andre Sevigny. A digital version may be located at the Family History Library. Irish Memorial, National Historic Site of Canada.